Home Healthcare and health reform health and medical research A new journal has launched: what do you think of its “ten grand challenges for public health policy”? A new journal has launched: what do you think of its “ten grand challenges for public health policy”? 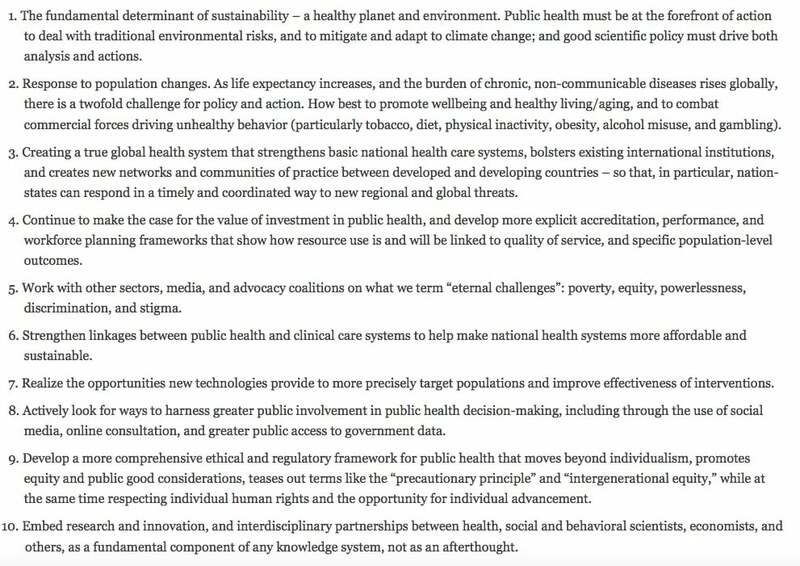 What are the ten grand challenges for public health policy globally? And what exactly is public health, anyway? Some suggested answers to the first question – offered by the joint chief editors of a new open access journal, Frontiers in Public Health Policy – can be found at the bottom of this post. Public health is a knowledge industry, driven by the importance of ideas (“the head”), and delivered by the hands of its diverse workforce. But, at its heart, it is underpinned by a passion for people and a commitment to change. Contributors to this new specialty journal should be unafraid to demonstrate that passion and commitment in their writing. I’ve been involved with starting a new international open access journal this year, called Frontiers in Public Health Policy (FPHP), which is a specialty section of Frontiers in Public Health. Frontiers in Public Health Policy was launched in March 2015 with myself and Ross Bailie as joint Specialty Chief Editors. We are committed to open access publication, because it seems particularly suited to public health, and we don’t think there should be a paywall between the public and public health research. We are excited by the Frontiers publishing model. Frontiers is a Swiss open access publisher. It is innovative with high quality editorial boards, transparent and interactive peer review and state of the art publishing. It also has other innovative features such as special Frontiers Research Topics (which are designed to foster international collaborations). Each Frontiers journal is composed of 15-20 specialty sections, and each section operates as an independent journal, except that all articles are published with the citation of the field journal (in this case, Frontiers in Public Health). I visited the editorial office in Lausanne in February, and was very impressed with the commitment of the publishing staff to support the editorial boards. Ross and I have created a mission statement for Frontiers in Public Health Policy with an ambitious aim to be the pre-eminent open access journal for public health professionals with a specific interest in policy and practice, and how the two are related – it’s available here. You might also like to read the inaugural ‘Grand Challenges in Public Health Policy’ article which helped to launch the journal. I hope the challenges resonate with you. Frontiers has an interesting peer review process, with the review editors working directly with the authors to refine the paper until it is suitable for submission. This is described well on the Frontiers website. In recognition of this, the name of the reviewer is published on the final manuscript. There is also an online Frontiers platform called ‘Loop’, which provides an opportunity to share news and build international networks. It’s been a lot of fun building up the ‘community of scientists’ around this journal – a mix of academics with policy interests, and policy people with academic skills. 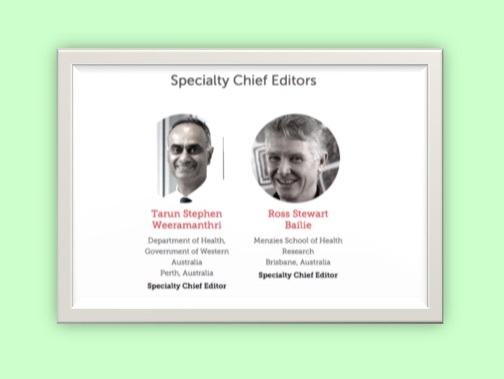 • Dr Tarun Weeramanthri is the Chief Health Officer for WA Health. He has served as Chief Health Officer in two jurisdictions (Northern Territory 2004-2007, and Western Australia 2008-present). He has a PhD in social medicine, and is a Fellow of Leadership WA. He has a strong commitment to the public sector, innovation and partnerships to improve the health of the whole population, both in terms of life expectancy and quality of life. His mantra is ‘put the public back in public health’, and he sees new technology and social media as vital tools in that effort. Meanwhile, some further reading about the Frontiers publishing model (which is not without controversy).